Healthy skin is important for looking and feeling great. The first step to achieve this is to clear up any acne - try making your own natural face wash - and then there are even many ways to clear up any scarring leftover from the acne with these DIY home tips. But there are some other skin issues which are actually harmless and not an indicator of poor health, but which can also be harder to get rid of. We're talking warts, skin tags, age spots, moles, and blackheads. Fortunately there are natural ways to remedy all of these issues, and we've listed them below. 2. Castor oil and baking soda. Mix the two ingredients to make a thick paste. Dip a cotton swab in the paste and dab it on the skin tag. 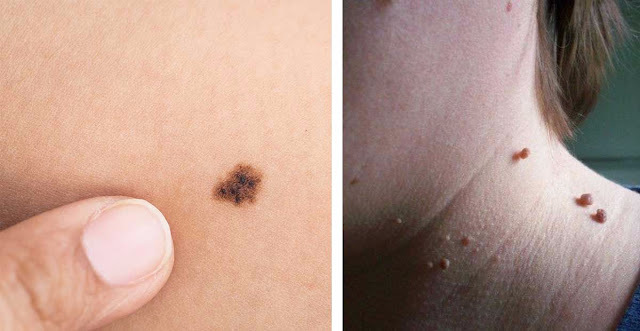 WikiHowsays this is among the best home remedies for skin tags. 15. Lemon juice. Is there anything lemon juice can't do? Natural Living Ideas explains that it contains alpha-hydroxy acid (AHA) citric acid, which works to remove dead skin and loosen clogged pores. Rich in vitamin C, lemon juice also stimulates collagen production to improve your overall skin health. After cleansing as per your normal routine, use a cotton ball to dab lemon juice onto your blackheads and allow it to dry. You can leave it on overnight or rinse after ten minutes. Be careful if you have broken skin - the juice will sting. Always exercise caution when using home remedies, and don't apply any substances high in natural acids to broken skin. Use only when the skin around the blemish is clean and healthy. As with most pharmaceutical treatment options for these skin issues the results will not be instant, but with daily use you should expect to see results within a few weeks. Let us know which treatments work for you!